You can now sync a Bluetooth keyboard with the Apple TV and use it to navigate and search on the device. This nice little bonus feature arrived along with the iOS 6.1 update, though it’s technically labeled for the Apple TV as 5.2 update, but regardless of the versioning and naming convention it’s an appreciated feature and finally brings the Apple TV in line with iPhone, iPod touch, and iPad for supporting wireless keyboards. It’s not going to function as a workstation (yet at least), but it does offer another way to navigate Apple TV. 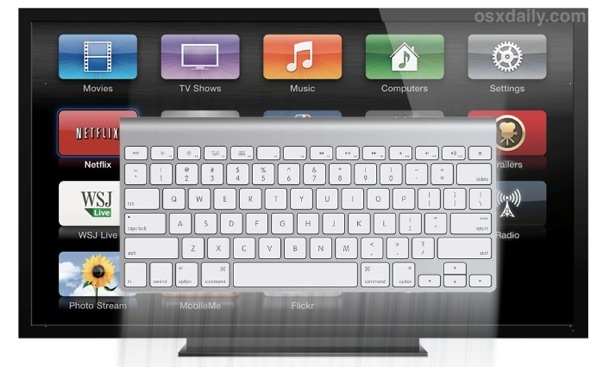 As we mentioned, you’ll need the newest Apple TV system software installed to sync keyboards. If you’ve never done that before, it’s not complicated. Now that you’re on the appropriate OS version, here’s what you’ll need to do to sync a wireless keyboard with the Apple TV. With that done you can now use a bluetooth keyboard as the primary input device on the Apple TV, which can make searching media and entering text quite a bit easier. Three cheers to Macgasm for pointing this out. Is this new? I thought we’ve been able to do this since 5.1 but I could be wrong. I always use my iPhone to control my Apple TV anyway. I am a bit hesitant to be excited about this feature because I think it is actually a step back in good usability. As Brent points out in the comments, it would make better sense to use other devices such as the iPhone to control the TV. Having a TV controlled with a keyboard brings me back painful memories of 2004 with TVs with really bad Internet connections and poor navigation control. Why are you so excited about this development? Why should a phone/pod/pad be needed? If they add bluetooth mouse support and begin treating it like an actual computer in some sense it won’t be 2004 again. Then again keep in mind back in 2004 the Operating Systems driving those Interent TVs were also trash. Before iOS, before Android. Before the mobile hardware powering them was the functional equlivent of the computers of that time (or better). The AppleTV is almost as good as the PowerBook I had back then. What makes this ‘happy’ is its yet another crack in Apple rather nonsensical denial of treating the AppleTV like what is, a computer attached to a TV. I use the remote app on my iphone to make that marginally less painful, sure, but if your use case for the AppleTV means a lot of text entry this is a nice solution. More to the point, why be down on an easy value-add for the people who it benefits? Nothing about this indicates the AppleTV is moving towards REQUIRING this sort of thing. But it’s an easy thing to throw in given the shared code with the iDevices that have offered this for a while. I think this is a great addition. Whether using a keyboard, iPhone or iPad.